. Articles about Enku 円空 and Mokujiki 木喰 . François Macé, « Et le sourire de Mokujiki révéla à Yanagi Sōetsu la beauté véritable », Cipango [En ligne], 16 | 2009, mis en ligne le 15 novembre 2011, DOI: 10.4000/cipango.370. 1For many Japanese art enthusiasts the names Mokujiki 木喰 (1718-1810) and Enkū 円空 (1632-1695) are inextricably linked, despite the one-hundred-year gap that separates them. In my mind they remain linked to the 1972 exhibition Enkū Mokujiki Ten in Tokyo, which presented their works side by side. At that time they represented the leading figures of a Buddhist art in robust health. They illustrated the vitality of Japanese artists during the Edo period, far from the purported decline of Buddhist art in modern times. 2And yet these two sculptor-monks, who appear as inseparable as Kanzan 寒山 and Jittoku 拾得, have only been associated quite recently, during the second boom in Mokujiki’s popularity. The first joint exhibition was held in Hokkaidō in 1953,1 with both monks having been long ignored previously by specialists in art history. Considered overly crude, their sculptures did not fall within the framework of an art synonymous with high culture. Simply put, they did not conform to the criteria of beauty. One appeared too primitive and violent, the other too naïve and awkward. 3However, in order to draw a parallel between them, they first had to be discovered. This was the job of Yanagi Sōetsu, who stepped in to rescue Mokujiki from oblivion, for Enkū had never left people’s memories. 4In fact, Enkū had been a well-known figure for some time, as evidenced by his inclusion in reference works from the 1920s and 1930s. The Dictionary of Buddhism – the first edition of which was published in 1933 –2 carries an entry on Enkū with accompanying picture, in which we learn that his biography appeared in book eleven of the Sequel to the Biographies of Eminent Monks.3 He is described as a monk, painter and sculptor who used only a billhook and travelled the length of Japan, from Kyūshū to the lands of the Ezo (Ainu), for the purpose of preaching. He generally lived in caves. The dictionary makes no reference to the artistic quality of his works but notes their effectiveness in pacifying dangerous spirits. It stresses the monk’s holiness, describing him as a “present-day Shakya” (Ima Shaka 今釈迦). 5However, if Enkū appears in the Sequel to the Biographies of Eminent Monks, it is because he had never been forgotten. Barely twenty years after his death, the illustrious Illustrated Compendium of the Three Powers in Japan and China4 noted that Enkū had offered a thousand carvings of Jizō to Mount Osore (Osorezan 恐山).5 The monk enjoyed another mention just a short time later, in the book Eccentrics of Our Times, published in 1790.6 An illustration even shows him carving a Buddha onto a living tree. 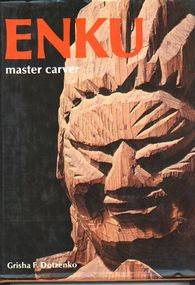 This book was followed at regular intervals by other publications relating Enkū’s life. 6Heibonsha’s Great Encyclopaedia, published between 1931 and 1933, devoted an equally long entry to Enkū as the Dictionary of Buddhism and featured the same picture.7 It indicated that Enkū belonged to the Rinzai School (when in fact he lived as a solitary monk attached to no institution, similar to the yamabushi, or mountain ascetics). These more or less reliable indications all seem to originate from the same source, most likely the Sequel to the Biographies of Eminent Monks. Strangely, neither of the two dictionaries carries a date. The Great Encyclopaedia even cites Enkū’s trip to the Ezo as having taken place during the late Ashikaga period (sixteenth century). Commentators primarily stress the piety that drove him to carve numerous statues, without ever mentioning their artistic value. I cannot speculate as to Yanagi Sōetsu’s state of mind as he studied the venerable Mokujiki, but today, when I think of Enkū as I contemplate his works, I can feel it. The holy man [Enkū] created countless Buddhas at Senkōji more than two hundred and thirty years ago. Yet one has difficulty believing it was so long ago. [These Buddhas] give the impression that just a short period of time separates us, a few years at most. 10The two 1930s’ dictionaries are also consistent in their disregard for Mokujiki. Mochizuki makes no mention of anyone by that name, despite the fact that several have existed in the history of Japanese Buddhism. The Great Encyclopaedia cites just one person, the famous Kōyasan monk Mokujiki Ōgo 木食應其 (1536-1608), a contemporary of Toyotomi Hideyoshi who rubbed shoulders with the mighty of his time and left behind numerous poems (renga) but not a single sculpture. 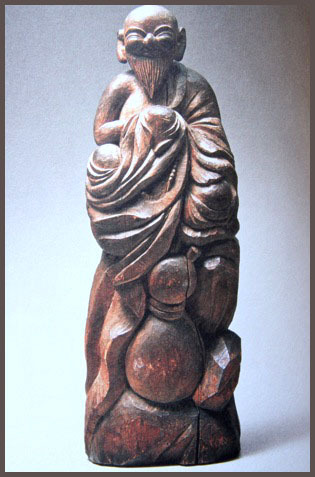 11The sculptor Mokujiki – Mokujiki Gogyō 木喰五行 – had been well and truly forgotten. While conducting research in the monk’s native province, Yanagi found no trace of him in regional histories from the period. He cites the example of the highly detailed History of Kai Province,11 which makes no reference whatsoever to Mokujiki. In other words, shortly after his death, Mokujiki had already been forgotten. We can presume that even during his lifetime his renown must have been limited. 13The rediscovery of Mokujiki appears to have been fortuitous. Yanagi Sōetsu describes how on 9 January 1923 he travelled to meet a certain Komiyama Seizō 小宮山清三, the village mayor of Ikeda, Yamanashi Prefecture. He was accompanied by Asakawa Takumi 浅川巧 (1891-1931), a specialist in Korean crafts. Both men were hoping to see the Korean porcelain wares that Komiyama collected. Yanagi, then aged 34, was working at the time on his plan to open the Korean Folk Crafts Museum (Chōsen minzoku bijutsukan 朝鮮民族美術館).16 In addition to the ceramic wares they had come to see, Yanagi’s eye was instantly drawn to two sculptures he found in the storeroom of their host. One was a statue of the Bodhisattva Ksitigarbha, known in Japanese as Jizō Bosatsu 地蔵菩薩; the other was of the Tathagata Amitayus, in Japanese Muryōju Nyorai 無量寿如来. 14Another statue, this time of Namu Daishi 南無大師,17 was found in Komiyama’s reception room. Each of the statues bore the signature of a certain Mokujiki. Yanagi’s enthusiasm for the beauty of these objects was such that Komiyama offered him the Jizō and subsequently helped him in his search for the mysterious sculptor named Mokujiki. 16It was not entirely by chance that these statues came to be in Ikeda, for Mokujiki himself was born not far away, in present-day Yamanashi Prefecture. Furthermore, during his long travels around Japan he returned to his native village Marubatake 丸畑 on three occasions. His final visit at the age of 83 was his most productive. At the request of local inhabitants he embarked on the construction of a Shikoku Hall, or Shikokudō 四国堂, which enabled the villagers to undertake the famous eighty-eight-temple pilgrimage around Shikoku (Hachijūhakkasho 八十八カ所) without leaving home.19 It was the ninety-one sculptures carved by Mokujiki for the hall that led to his discovery, for the building itself was destroyed during the Taishō era (1912-1926) and the statues it contained dispersed shortly before Yanagi’s visit. It was three of these statues that Yanagi saw at Komiyama’s house. The memory of their origins had not had time to be erased. 17It should be noted that these sculptures belonged to a period in which the monk’s skill was at its peak. If Yanagi had seen statues from Mokujiki’s early period, would he still have been quite so struck by them? Travelling the length and breadth of Japan, contemplating the eight sects with one glance, thinking only of the edification [of all], the sculptor of Buddhas leaves them in places with which he has ties throughout the provinces. This is his main vow among the ten great vows21. Each Buddha is part of Japan’s one thousand statues. 19This text would be accompanied by the date of the statue “opening its eyes” and the sculptor’s name. 20The second stage in Yanagi’s quest was marked by his discovery of Mokujiki’s papers in the monk’s native village. His family had conserved the notebooks in which he recorded the names of all the places in which he had stayed22 and those in which he had made an offering of sutras,23 as well as a collection of poems (waka) and, most of all, what appears to be his autobiography, the Mirror of my Heartfelt Prayers from Shikoku Hall (Shikokudō Shingankyō 四国堂心願鏡). Yanagi wrote of his joy at being able to consult these documents. Having been asked to return it the following day, he spent an entire night feverishly copying out the Mirror of my Heartfelt Prayers. However, with the aid of Komiyama he was later able to borrow the documents and study them at leisure. 21This information enabled Yanagi to conduct his investigations with a certain precision24 and he rapidly set out to retrace Mokujiki’s footsteps. In less than a year he succeeded in recovering three hundred statues located around Japan. He also enlisted the help of friends such as Mushanokōji Saneatsu 武者小路実篤 (1885-1976),25 taking advantage of Mushanokōji having moved to Kyūshū to establish a cooperative community by asking him to search for the Mokujiki statues he knew to be located on the island. Yanagi published his initial findings in 1924-1925, in seven issues of the journal Josei 女性 (Woman), before publishing them in a single volume entitled Mokujiki shōnin no kenkyū 木喰上人之研究 (Research on the Venerable Mokujiki).26 He continued his research until 1926 before devoting himself entirely to the Folk Crafts Movement. With the trend thus set, other researchers were able to pursue his work with the support of the Mokujiki Research Association (Mokujiki Kenkyūkai) he had set up. 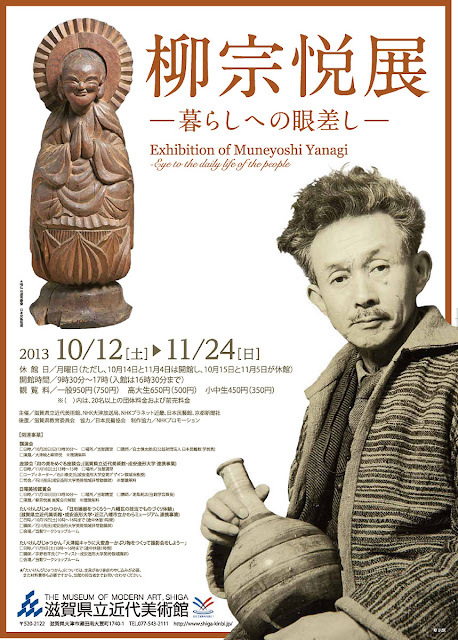 Yanagi later organised the first Mokujiki exhibition in Kyoto in 1935. From a certain point of view his works could be considered ugly […]. But for he who had become a solitary monk, what reason could he have had to waver before ugliness? Moreover, where is the conflict with beauty? He possessed no-mindness [mushin 無心] in all that he did. Lack of affectation in beauty does not imply lack of beauty. Apparent ugliness is not derived from ugliness. Modern men have endeavoured to capture a new kind of beauty from ugliness. One could call the carvings of this Holy Man modern. However, unlike our current era of conflict, the Holy Man had attained a state of mind where there was no distinction between beauty and ugliness [bishū funi 美醜不二]. In fact, choosing beauty over ugliness is but another passion that clouds the judgement. Simplicity is not crudeness and no-mindness [mushin 無心] is not ignorance. Thus, religious art usually expresses a simple beauty. Artificial ideas do not create art. His works are simple and natural […]. He was aware of his lack of technique and was not ashamed. What is striking, no matter who we are, is the facial expression. What other sculptor was able to capture and convey the smile of the Buddhas so intensely? In the history of sculpture, smiling Buddhas begin with him […]. This smile makes the Buddhas appear familiar to us. 26However, the coarseness of his sculptures does not signify that Mokujiki was ignorant, far from it. As a monk trained in the Shingon School of esoteric Buddhism he knew the seed characters31 for all the great Buddhist figures he carved – over fifty names by Yanagi’s estimate–32 and as we saw earlier, he also left a collection of poems. 27Mokujiki’s personality posed a further problem. Though he was barely known to his contemporaries, this travelling monk was by no means an anonymous craftsman. Not only did he sign his works, he also gave himself extraordinary titles such as Bodhisattva Gogyō (Gogyō Bosatsu) or Immortal Myōman (Myōman Sennin). By fulfilling his vow to travel around Japan offering thousands of Buddha statues, he had attained a state that was beyond mere humanity. In addition to carving Buddhas and Bodhisattvas, he also created images of himself on several occasions. for the enlightenment of his mother and father. The Immortal Myōman - Aged 90. 30We are well and truly in the presence of something unique. It was this uniqueness that Yanagi was at pains to highlight in Mokujiki’s style and which belonged to no particular school. 32Mokujiki’s religion was a joyous one. The ascetic practices he undertook did not give him a pessimistic view of the body. Under his chisel, all his figures appear to be overcome with joy. Even Fudō Myōō 不動明王 (Acalanātha), the Immovable Wisdom King, appears benevolent rather than fearful. 33The painter and printmaker Munakata Shikō 棟方志功 (1903-1975) first met Yanagi in 1936 during an exhibition. He certainly must have found an echo of his own aesthetic choices in the optimism of Mokujiki’s sculptures. Both sets of works possess the same round volumes. 34As far as Yanagi was concerned, his discovery of the Jizō statue in Ikeda was not of the same order as a collector unearthing a rare find or a historian discovering an unknown document. The statue triggered a profound aesthetic emotion within him that had strong religious connotations. His entire being entered into a kind of communion with Mokujiki, this itinerant monk with an extraordinary vitality who lived his entire life among the common folk. In fact, on several occasions when describing his discovery, Yanagi employed a passive-tense construction, suggesting that it was not he who had recognised the statue’s beauty but rather the statue’s beauty that had revealed itself. 35Regardless of his own personal feelings, Yanagi could not have shared his enthusiasm without having access to a fertile breeding ground. He was a member of the Shirakaba group, a society of Tolstoy admirers who transposed the Master’s ideas on the power of folk wisdom to Japan.37 Over in another field, this was also the period in which Yanagita Kunio 柳田國男 (1875-1962) was at his most active.38 The “common people” (jōmin 常民) that he and some of his contemporaries strove to save from oblivion was the very same one Mokujiki had lived among. 36Nevertheless, Yanagi’s conception cannot merely be described as nostalgia for an idealised rural lifestyle or a somewhat chauvinistic taste for the country. First of all, he emphasised the importance of the spiritual quest. It was Mokujiki’s deep faith that shone through in the smile of his statues. I would not have been surprised to learn that Yanagi liked Hakuin Ekaku 白隠慧鶴 (1686-1768) and his laughing Buddhas,39 but I found no evidence of any interest in the paintings of Zen monks, which were probably not rustic enough for his liking. Furthermore, Yanagi never confined himself to Japan. He was also drawn to Blake and Korean folk crafts, something that was highly unusual in a colonial era characterised by oppression and contempt. He fought to save Gwanghwa gate 光化門 at Seoul’s royal palace from destruction and also opened the Korean Folk Crafts Museum in Seoul.40 He contributed to the wave of interest shown in Okinawa by certain intellectuals. In this respect, his research on the crafts of this southern island chain converged with that of the master dyer Serizawa Keisuke. 37More than anything, Yanagi insisted that Mokujiki had been out of step with his era; that the time had come for him to be discovered; that he was a contemporary artist. Yanagi was not a man with his eyes riveted on the past. His network of friends included numerous artists. We have already met Kawai Kanjirō, Munakata Shikō and Serizawa Keisuke. We could add to this list Umehara Ryūzaburō 梅原龍三郎 (1888-1986), a painter in the Western style with close links to the Shirakaba group. None of these artists could be classed as “regionalist”. Umehara applied the teachings of Renoir, Munakata was the first non-European to be awarded the Grand Prix at the Venice Biennale in 1956, while Serizawa’s reputation spread far beyond Japan’s borders. For this free Holy Man there was neither attachment to tradition nor opposition to tradition […]. Originality was not something he would have invented. It sprang forth from him spontaneously [mushin ni 無心に] […]. His works bear no trace of imitation. He did not seek to preserve a method and had no usual style. There is no doubt in my mind that he should be commemorated as the most original sculptor of Buddhas Japan has ever known. 39In my opinion, among the elements that enabled Yanagi to see the beauty of Mokujiki’s sculptures, we should not forget his having trained his eye through his study of Western artists, who themselves presented a break from classicism and academicism. We have this account from Munakata Shikō, a great admirer of Van Gogh since his youth, upon discovering Enkū’s statues in Ōmiya in 1960. After holding them in his arms and kissing them, he exclame: “Enkū must be the Munakata Shikō of the Genroku era. And Munakata Shikō must be the Enkū of the Shōwa era”.42. The same Munakata had said that he would be another Van Gogh. It was this abolition of time that Yanagi experienced when he contemplated Mokujiki’s Jizō. 1 Mokujiki Enkū ryōshōnin isakuten 木喰・円空両上人遺作展, Hokkaidō, Esamachi Kōminkan，江差町公民館. On Enkū’s reception, see Tanahashi Kazuaki 棚橋一晃, Enkū no geijutsu 円空の芸術, Tōkai Daigaku Shuppankai 東海大学出版会, 1979. For French publications see Anne Bouchy, « Une voie de “l’art premier” dans le Japon du xviie siècle. La statuaire d’Enkū, le pérégrin de l’Essentiel » (A “Primitive Art” in 17th-century Japan. The Statues of Enkū, Pilgrim of the Essential), L’Homme, no 165, 2003, p. 143-172. 2 Mochizuki Shinkyō 望月信亨, Bukkyō daijiten 仏教大辞典, 7 volumes. The revised and expanded edition dates from 1958. 3 Zoku Nihon kōsōden 続日本高僧伝, a book begun in 1867 and completed in 1884. 4 Wakan sansai zue 和漢三才図会 by Terajima Ryōan, completed in 1715 and modelled on the Chinese Sancai tuhui 三才図会. 5 Gorai Shigeru 五来重, Enkū butsu 円空佛, Kyoto, Tankōsha 淡交社, 1977, p. 118. 6 Kinsei kijinden 近世畸人伝, by Ban Kōkei 伴蒿蹊 (1733-1806), published in Kyoto in 1790, and containing around 100 biographies, including those of Nakae Tōjū, Kaibara Ekiken, and the monks Tōsui and Keichū. Republished by Iwanami in 1972 in their paperback collection. François Lachaud translates the title as Vies d’excentriques de notre temps (The Lives of Eccentrics of Our Time) in Le vieil homme qui vendait du thé. Excentricité et retrait du monde dans le Japon du xviiie siècle (The Old Man Who Sold Tea: Eccentricity and Retirement from the World in 18th-century Japan), Paris, Éditons du Cerf, 2010, p. 50. 7 Dai hyakka jiten 大百科事典, Heibonsha 平凡社, 18 volumes. 8 Page 141 of his diary, quoted in Enkū to Hashimoto Heihachi 円空と橋本平八, edited by Honma Masayoshi 本間正義, Kindai no bijutsu 16 近代の美術 16, Shibundō 至文堂, 1973, p. 18. 9 Enkū butsu to no innen 円空佛との因縁, Mingei, September 1959. 10 Mokujiki shōnin 木喰上人 (The Venerable Mokujiki), Yanagi Sōetsu senshū 柳宗悦選集 (Selected Writings of Yanagi Sōetsu), Tokyo, Shunjūsha 春秋社, vol. 9, 1955, republished in 1972. 11 Kai kokushi 甲斐国志, completed by Matsudaira Sadayoshi 松平定能 in 1814, consists of 124 books. Kai Province roughly corresponds to present-day Yamanashi Prefecture. 12 Our sculptor took the name Mokujiki Gyōdō 木喰行道 (Tree Eater, Path of Asceticism) after receiving the “tree-eating precept” (mokujikikai 木喰戒) in 1762. At the age of 76 he then changed his name to Mokujiki Gogyō Bosatsu 木喰五行菩薩 (the Bodhisattva Tree Eater of the Five Practices), before finally becoming Mokujiki Myōman Sennin 木喰明満仙人 (the Immortal Tree Eater Full of Light) at the age of 89. 13 On the subject of Edo-period eccentrics, see François Lachaud op.cit. 14 Gorai Shigeru, Itan no hōrōsha no kanjin to waka 異端の放浪者の勧進と和歌 (The Poems and Quest of Itinerant Heretics), in Tanahashi Kazuaki, Mokujiki butsu, Kajima Kenkyūjo Shuppankai, 1973, p. 122. 16 For more on this subject see Christophe Marquet’s article in this issue of Cipango. 17 Abbreviation of Namu Daishi Henjō Kongō 南無大師遍照金剛, an alternative name for Kōbō Daishi 弘法大師 (Kūkai 空海) used to invoke him in his mausoleum on Mount Kōya. 18 The details of this discovery are related in his book Mokujiki shōnin, op. cit., pp. 4-14. They had been explained previously using similar wording in 1925, in his Brief Biography of the Venerable Mokujiki Gogyō (Mokujiki Gogyō shōnin ryakuden 木喰五行上人畧伝, which itself was reprinted as Mokujiki shōnin hakken no engi 木喰上人発見の縁起 (Origins of the Discovery of the Venerable Mokujiki) in Mokujiki butsu, edited by Tanahashi Kazuaki, op. cit., pp. 180-199. 19 The term ‘hall’ requires clarification. It would in fact have been a very simple building, just large enough to house the statues. The number 88 refers to the ‘main objects of worship’ (honzon) at each of the temples on the Shikoku pilgrimage. Mokujiki added a statue of Kōbō Daishi, a self-portrait and an image of Daikokuten (Mahākāla). 20 Tanahashi, Mokujiki butsu, op. cit. p 98. 21 These are the Ten Great Vows of the Bodhisattva Samantabhadra (Fugen Bosatsu 普賢菩薩), as described in the Flower Garland Sutra (Kegonkyō 華厳経), and which express the Bodhisattva’s compassion for all living creatures. 22 Yadochō 宿帳: travel diaries in which Mokujiki kept a daily record of the village or hamlet in which he was staying, the type of accommodation (temple, chapel) or the name of the person who took him in. Almost all of the place names were written in katakana. 23 Hōkyōchō 奉經帳: notebooks listing the objects crafted by Mokujiki and left as offerings. 24 It was through these papers that Yanagi knew that Mokujiki had spent a long time on Sado and thus visited the island himself. 25 Mushanokōji was Yanagi’s senior at Gakushūin – a higher educational establishment attended by the children of the Imperial Family, the aristocracy and high society – and a member of the Tolstoy-inspired Shirakaba group, just like another of Yanagi’s friends, Shiga Naoya 志賀直哉 (1883-1971). 26 He released the final version in 1955, with illustrations by Serizawa Keisuke, in volume 9 of his Selected Writings, published by Shunjūsha. Serizawa Keisuke 芹沢銈介 (1895-1984), a master dyer and printmaker, contacted Yanagi in 1928 after reading his essay Kōgei no michi 工藝の道 (The Way of Crafts). 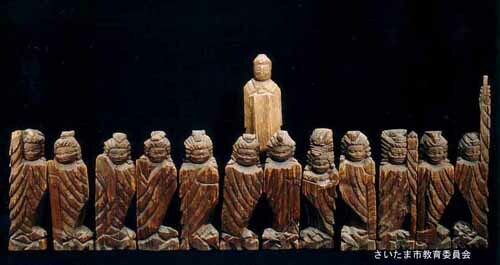 27 Hachijūhachi-tai butsu no bi 八十八躰佛の美 (The Beauty of the 88 Buddhas), in Mokujiki shōnin , op. cit., pp. 237-245 and in particular p. 243 et seq. 28 Yanagi stressed how difficult it was to trace the place names recorded in Mokujiki’s travel diary. Many did not appear on any map. 30 This was also the opinion of Kawai Kanjirō 河井寛次郎 (1890-1966), a sculptor and above all potter who made a name for himself in 1921 thanks to an exhibition at the department store Takashimaya. Kawai felt unsatisfied with his work. Drawn to the Yi Dynasty porcelain studied by Yanagi, he shared his enthusiasm for these anonymous craft wares and accompanied Yanagi on many of his trips to conduct research on Mokujiki’s sculptures. For further information on Ōtsu-e, see the article by Christophe Marquet in this volume of Cipango. 31 Shuji 種子: a letter from the Sanskrit alphabet is used to symbolise a Buddha or Bodhisattva, providing a means of representing or invoking them. For example, the letter kiriku (hrih) denotes Amida. 32 Mokujiki shōnin, op. cit., pp. 114-115. 33 Tanahashi, Mokujiki butsu, op. cit., p. 133. 35 He published his results in Genza d’Inaba, a Wonderfully Good Man (Myōkōnin Inaba no Genza 妙好人因幡源左). Genza d’Inaba (1842-1930) was a simple peasant known for his deep faith in Amida. The monograph by Yanagi and Kinugasa Isshō 衣笠一省 was published in 1960 by Hyakkaen 百華苑. 36 Yanagi Muneyoshi shūkyō senshū 柳宗悦・宗教選集 (Tokyo, Shunjūsha, 1960-1961): 1. Shūkyō to sono shinri 宗教とその真理 (Religion and its Truth), 2. Shūkyō no rikai 宗教の理解 (Understanding Religion), 3. Kami ni tsuite 神について (On the Divine), 4. Namu Amidabutsu 南無阿弥陀佛 (Invocation of Amida Buddha), Ippen shōnin 一遍上人 (Ippen the Holy Man), 5. Shūkyō zuisō 宗教随想 (Thoughts on Religion). 37 See the article by Michael Lucken in this volume of Cipango. 38 See Damien Kunik’s article and translation of the discussion between the two men. 39 See, for example, Hakuin zen to shoga. Hakuin zenji seitan 320 nen 白隠禅と書画 — 白隠禅師生誕320年 (Paintings and Calligraphy by Hakuin. 320th Anniversary of the Zen Master’s Birth), Kyōto Bunka Hakubutsukan 京都文化博物館, 2004. 40 See the article by Pierre Souyri in the 2010 volume of Cipango on Korea and the colonial period: « La critique du colonialisme dans le Japon d’avant-guerre » (Criticism of Colonialism in Pre-war Japan). 41 Hachijūhachi-tai butsu no bi, in Mokujiki shōnin, op. cit., p. 237. 42 Akiyama Kikuo 秋山喜久夫, Koi Enkū 恋円空, Urawa, Saitama Ken Kyōdo Shiryō Kankōkai 埼玉県郷土史料刊行会, 1973, p. 23. 43 To my knowledge there has not yet been a European exhibition on Mokujiki, whereas Enkū’s work was exhibited in Antwerp in 1999. See Jan Van Alphen, Robert Duquenne et al., Enkū, 1632-1695: Timeless Images from 17th-Century Japan, Anvers, Etnografisch Museum. 44 I would like to thank Christophe Marquet and Jean-Michel Butel for their thorough editing and corrections.
. Yanagi Soetsu Muneyoshi 柳宗悦 (1889-1961) .
. Enku on Facebook .
. Mokujiki 木喰 (1718 - 1810) .
. Statues carved by Enku - LIST .
. Enku - Temples and Shrines - INFO .
. Enku and the Mountains of Japan - INFO .